Kit includes: Sephra Select 16" Home Chocolate Fountain, 4 lbs Sephra Milk Chocolate Melts, 400 bamboo skewers. Great for birthday parties, holiday parties or just fun family time! FREE GROUND SHIPPING. The perfect small party chocolate fountain kit. Kit includes: Sephra Select 16" Home Chocolate Fountain, 4 lbs Sephra Milk Chocolate Melts, 400 bamboo skewers. 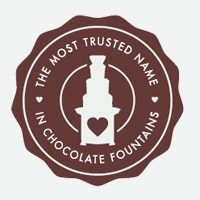 The Select chocolate fountain holds 4 lbs of chocolate and needs 3 to run. Feeds 20-30 people. Add more chocolate to feed up to 40 people. The "little brother" of Sephra's larger home fondue fountains, the 16" Select Home Fondue Fountain is the perfect size for small gatherings. Makes a great gift for the chocolate enthusiast or the person who has everything! Perfect for cheese fondue and caramel fondue, BBQ sauce and ranch dressing. With its streamlined styling and beautiful brushed stainless steel finish, it will be the highlight of any special gathering. The heated basin allows you to melt the chocolate in the fountain, and the QuickSet tier system and dishwasher safe parts make cleaning a breeze. Heated basin melts chocolate in the fountain (heat on/off control); Dishwasher safe parts; Food grade high-impact plastic tiers; QuickSet tier assembly sets up in seconds; Stainless steel basin; and WhisperQuiet motor. Serves up to 20 people at full capacity.